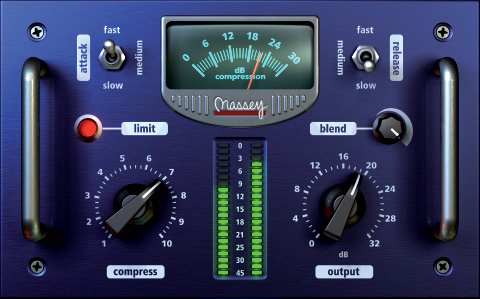 Over the last few years, Steven Massey has been quietly making a name for his range of high-quality yet affordable plug-ins, and the new CT5 compressor can only enhance his reputation. It's based on his existing CT4 design, to which it adds considerable flexibility without compromising the original's laudable ease of use. It's also Massey's first foray outside the Pro Tools-only RTAS and TDM formats. Massey says that CT5 is designed to have "both electro-optical and vari-mu characteristics”, and its control set certainly recalls the classic Manley Vari-Mu valve compressor. There's no ratio control, nor a conventional threshold dial: instead, you apply more compression by turning up a single knob labelled 'compress'. There's a choice of three attack and release times, an output make-up gain control, and that's almost it, apart from a couple of neat additional features that weren't in CT4. One of these is a Blend control allowing you to mix in some of the dry signal for parallel compression, while the other is a red button labelled 'limit'. Like the similar function on the classic Universal Audio LA2A, this swaps the default gain-reduction algorithm — smooth, progressive compression with an extreme soft-knee characteristic — for something more obvious and disciplinarian. Despite its comparatively minimal feature set, CT5 is a versatile animal. 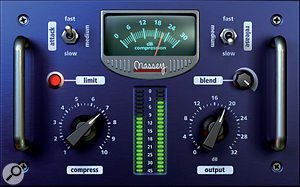 Even in 'limit' mode, it won't give you the aggressive, super-fast bite of an SSL compressor or an 1176, but it shines wherever you want a compressor that responds naturally and sympathetically to a source signal. In use, I quite often had the experience of opening up the plug-in and being surprised by how much gain reduction was being indicated by the VU meter, without the source sounding flat or over-processed. It handles delicate signals such as fingerstyle guitar in a very musical fashion, but, at the same time, is perfectly capable of controlling an over-dynamic bass guitar or adding punch to drums. CT5 works pretty well as a bus compressor too, especially on gentler material. It definitely has some of the velvety quality of Vari-Mu emulations such as NI's Vari Comp, but on the whole is more transparent and less 'rich-sounding', and probably better suited to everyday use, especially bearing in mind its very low CPU overhead. 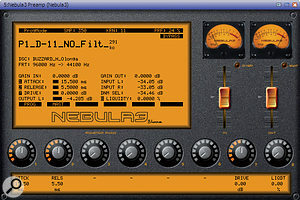 Acustica Audio's Nebula 3.5 convolution plug-in dynamically captures sounds from both analogue and digital hardware effects, and there are now a handful of talented third-party developers releasing libraries for it that enable any musician to sample the delights of boutique audio hardware at pocket-money prices. Henry Olonga (yes, he of international cricket fame, formerly of Zimbabwe but now based in London) has recently launched a new web site to host his own unique collection, as well as partly to raise money for a Zimbabwean charity. He openly admits that his Nebula libraries will eat CPU and RAM for breakfast, as well as plenty of hard-drive space, yet their prices are so low (between £3 and £7) that they become difficult to resist! Most third-party Nebula developers manage to carve out their own niche, and Henry specialises in using Nebula's preamp template to capture the frequency response and harmonic signature (aka the 'mojo') of a whole range of desirable analogue hardware. His range now includes some 76 libraries, with plenty of high-end preamps (both as single items and pre-assembled into signal chains, along with EQ for specific treatments suitable for kicks, vocals, guitars and so on), as well as some tape simulations and a few specialist DI boxes. I tried out various libraries from the range to get a feel, and was impressed by their audio quality, despite occasional 2.5kHz 'ringing' problem with a few presets when driven hard. 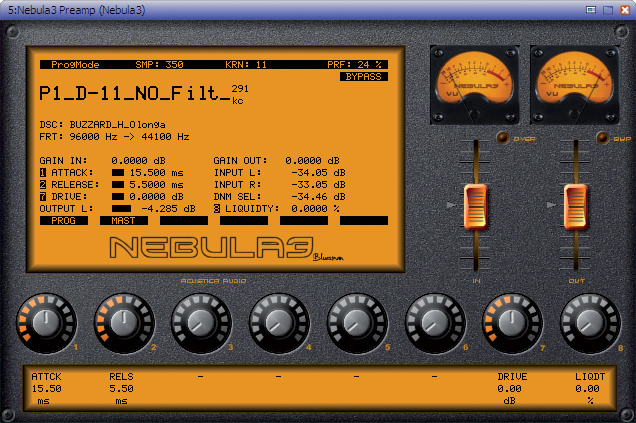 Captured with high-end Prism Orpheus converters, most are supplied at 192kHz, 96kHz and 44kHz sample rates: Nebula can perform its own internal conversions if you want to work at other rates, but this increases loading times. The NV Pre collection samples a replica Neve 1073 mic preamp at seven different gain values, and while the low settings provide extremely subtle enhancements, higher-gain presets introduce a few percent of mostly second- and third-harmonic distortion, the characteristic rich low end, and a softer top end, just like the hardware. At £3, this is a absolute bargain, as is the set of Quick Kick chains comprising six preamp emulations (including Broadhurst Gardens, GML and a couple of Neves) combined with various scooped EQ settings to help your kick drums sit in the mix. Sometimes the simplest ideas are the best, and the idea behind Trackspacer is so simple that I'm surprised I've never seen another plug-in that does the same thing. Most SOS readers will probably be familiar with the concept of 'bracket' equalisation, where EQ cuts are applied to minimise the overlap between two instruments in a mix, with the aim of improving clarity. For instance, it's often possible to improve the separation between a bass guitar and a bass drum by cutting at different frequencies, so as to give each of them their own space in the mix. Likewise, where you need to make a vocal more audible over a wall of guitars, judicious mid-range cuts in the guitar tracks can allow the vocal's strong frequencies to come through more clearly. What Trackspacer does is, in effect, to automate the process of equalising one instrument to make more room in the mix for another. If, for example, you needed to clear some space in the guitars to let the vocals come across, you'd insert Trackspacer on the guitar track or bus, and set up a send from the vocal track to Trackspacer's side-chain input. Trackspacer would then analyse the side-chain signal (in this case, the vocal) to determine where its main frequency content lies, and attenuate these frequencies in the track on which it was inserted. User control is relatively limited, the main user interface elements being a large dial, which sets the amount of attenuation, and a Freeze button. 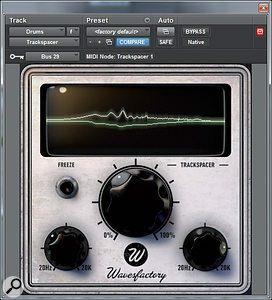 If you don't press this button, Trackspacer continuously updates its analysis of the input and adjustment of the output, making it behave like a complex sort of multi-band compressor or dynamic EQ. Pressing it takes a 'snapshot' of the side-chain signal and fixes the EQ curve. High and low frequency controls let you restrict Wavespacer's processing to a particular frequency band, which is useful when you want to reshape mid-range frequencies and leave the bass alone, for instance. 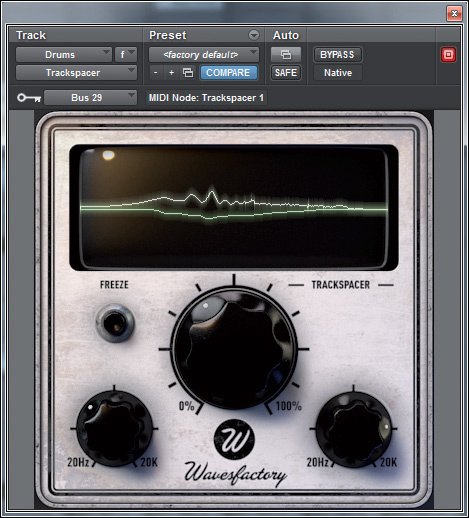 In practice, Trackspacer works very well, as long as your DAW enables side-chaining: I couldn't get the VST2.4 version to work in Cubase, but had no problems with either the VST3 version or with the RTAS version in Pro Tools. Its analysis often creates EQ curves that are quite a lot more complex than could easily be crafted by ear, and in general, these do an effective job of ducking only the frequencies that risk masking the side-chain signal. When you don't use the Freeze function, moreover, these adapt in a pretty natural and smooth way to changes in the timbre of the source signal. 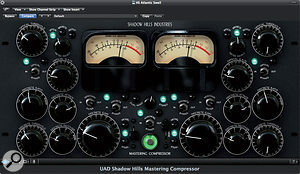 The Shadow Hills Mastering Compressor has to be one of the most visually impressive compressors on the market, and I defy anyone not to fall in love with its blacker-than-black 5U casework, oversized Bakelite knobs and 'magic eye' level metering. You can buy a car for less money, so there's obviously a lot going on behind that gorgeous panel. Fortunately, it has now been modelled for the UAD2 platform by the Brainworx software team, for closer to the price of a bicycle, with the approval of Shadow Hills' Peter Reardon. Peter clearly has a good sense of humour, because his manual also includes instructions for destroying the compressor in the event that it is about to fall into enemy hands! A key feature of the original design is its separate optical and discrete VCA dynamics stages, giving a choice of different compression styles or the option of two-stage processing. Each section has threshold and make-up gain controls, and each can be bypassed independently. Another novel, if decadent, addition is the ability to switch between three different types of audio output transformer: Nickel, Iron, and Steel. Nickel produces the least coloured sound, with Steel imparting the most character, and you can bypass both compressors and just use the transformer audio path to add colour. Side-chain filtering via a 90Hz high-pass side-chain filter can prevent extreme lows dominating compressor activity, although there's no external side-chain input, which seems remiss on a compressor of this calibre. There's also generous metering that can monitor either compressor's activity, as well as following the output level. The plug-in version can be run in stereo (in which case both sides follow the left-hand controls) or used for dual-mono operation, even when instantiated in a stereo insert. Its optical electro-luminescent attenuator compressor stage, which has a fixed 2:1 ratio, features a two-stage release time similar to that of UA's own LA2A, and has a smooth and musical sound typical of an opto design. The Discrete section, which uses a feed-forward topography (it monitors its own input rather than output) is capable of more assertive compression, and offers control over gain, threshold, ratio, attack and release. It even has a Flood ratio setting for seriously heavy compression. The ratio, attack and release times are all switched rather than continuously variable, with a further Dual release setting (fully clockwise) that mimics the opto section's release characteristics. For mastering, both stages would normally be set up for fairly subtle compression; for mixing, the optical compressor is particularly kind to vocals, while the discrete one is ideal for firming up (or beating up!) drums and bass. Although the GUI looks very much like the hardware, I did find some of the switches and buttons hard to pick out, thanks to the black-on-black colour scheme and very small legending. However, it doesn't take long to find your way around, and it doesn't take much longer than that to realise that this is one versatile compressor. For mastering you have to be pretty subtle: my usual approach is to dial in around a dB or so of optical gain reduction and then, at the lowest ratio, a couple dB more of VCA gain reduction. The manual suggests an attack time of 30ms and a release time of 100ms, which certainly provides the magic glue without seemingly interfering with the natural dynamics of the track. By contrast, if you crank up the ratio on the Discrete compressor and drop the threshold, you pass through all shades of assertive and end up at downright slamming. 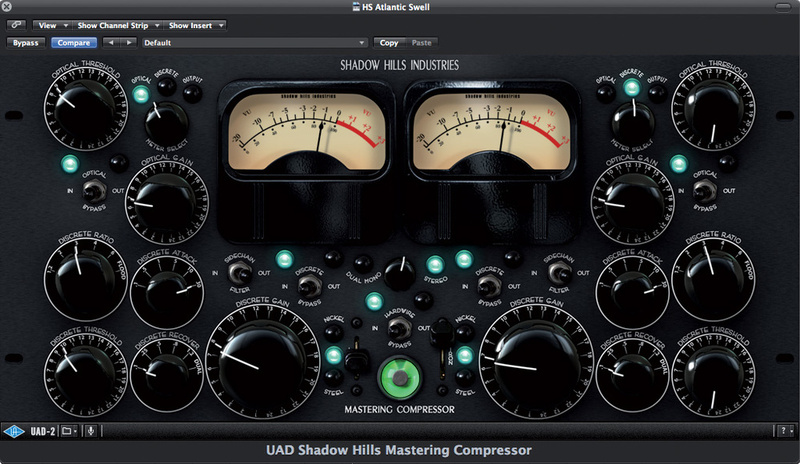 Used more heavy-handedly, the Shadow Hills makes a fantastic drum compressor, and if your thing is French house-style compression, where the whole track pumps, you couldn't be in better hands, although an external side-chain input would have made it even more flexible in this area. I've tried numerous compressors that are great at transparent compression and others that offer attitude in spades, but this one really does deliver whatever shade you need, and with bags of style. Those transformer options make a noticeable difference, too. Nickel is the most transparent, iron adds a bit of flavour and a hint of brightness, and steel has a gritty edge to it that works to add life to material that needs it.